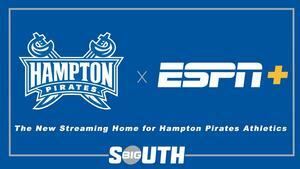 CHARLOTTE, N.C. (August 20, 2018) – Hampton University fans will get to enjoy HU athletes on a whole new level this fall as the Big South has partnered with ESPN+, bringing 24 Hampton dates to a national audience. Hampton will see 12 volleyball matches, six soccer matches, and all six football home games on ESPN+ as presentations of the Big South Network. ESPN+ is the exclusive streaming home of Big South Network productions. Fans can subscribe to ESPN+ for just $4.99 a month (or $49.99 per year). ESPN+ is an integrated part of the completely redesigned ESPN App. Below is the schedule, sorted by date, that Hampton will appear on ESPN+. The schedule is subject to change with the most up-to-date schedules being listed on BigSouthSports.com. All contests are available exclusively on ESPN+. All Big South Championships, beginning with quarterfinal action, will also be broadcast on ESPN+.